Q: Who will be affected by this rule? A: Food businesses such as producers, manufacturers, packers, importers, distributors, wholesalers, retailers, caterers and officers responsible for audits or enforcement. Q: What is the purpose of this change? A: Food allergies can cause very serious reactions and consequences when the allergenic ingredient is consumed. The regulation aims to make it easier for people with these allergies to identify ingredients they need to avoid. 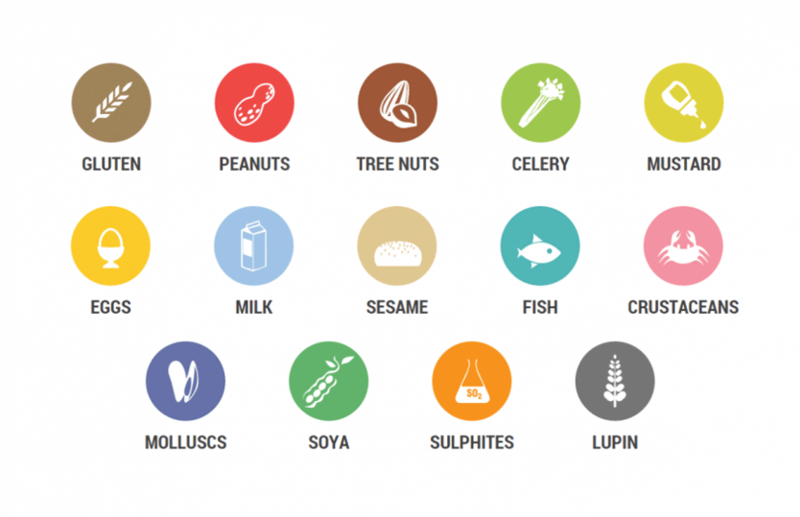 Q: What are the 14 listed allergens? A: Gluten, crustaceans, eggs, fish, peanuts, soybeans, milk, nuts, celery, mustard, sesame seeds, sulphur dioxide and sulphites, lupin, molluscs. More detailed information can be found in Annex II of the Directive. Q: There are other ingredients people may have allergies to. Should they be presented? A: They can be presented voluntarily, but are not mandatory. Only the 14 listed allergens are required. Q: How should allergens be presented on the nutrition label? A: Foods that have been established as being responsible for allergic reactions, and any food containing these ingredients, need to be clearly displayed and highlighted (such as putting in bold, italic or highlighted print). See a sample of how allergens should look on your labels. Q: Does the regulation apply only to prepacked goods? A: No. As of December 2016, presentation of allergen information will be mandatory for non-prepacked goods as well. It will affect retailers, restaurants, takeaways, bakeries and institutional caterers (prisons, nurseries, schools, hospitals, workplace canteens etc). Information on allergens can be provided in writing and/or orally. Q: Does the minimum font size requirement apply for allergens too? A: Yes. For the majority of food packaging labels, a minimum font size of 1.2 mm should be used (Times New Roman, 8 font). For smaller packages where the largest surface area is below 80cm2, a minimum font size of 0.9 mm should be used (Times New Roman, 6 font).